Being ready for a new relationship after your divorce is finalized is not an exact science. The assistance of a mental health professional can be beneficial. Do not compare your readiness to your ex-spouses. With how much pressure in society revolves around personal relationships, it can be emotionally exhausting for those who have just experienced a divorce. You can feel like you have failed in some way or have not done enough to keep up with peers. While comparisons like that are rarely healthy or useful, the inclination is a natural human reaction and a result of no longer having someone so ingratiated into your day-to-day life. With all of this pressure, you may feel like you need to get back out there and start dating as soon as possible. You may rush into a new relationship and not be able to handle it, simply because you are not ready. Being ready for a new relationship is not an exact science. It is not based on the number of years that you have been married, nor is it based on how recently you have gotten divorced. It is entirely dependent on the individual and how they are handling the mental and emotional side of the divorce experience. You have to know yourself, which can be challenging. You may no longer trust your own judgment after a divorce, because of how committed you may have been to your significant other. Some who go through the divorce process feel that because they entered a marriage that did not last, their judgment is suspect and thus, they are incapable of making impactful life decisions. Additionally, you also may jump into a new relationship without considering the feelings of a potential new partner. As much as you may feel like you are ready to move on, if your potential new partner feels as though you are using them to get over your ex-spouse, you need to consider slowing things down or waiting until you have moved on. This may sound like you are allowing your divorce to have control and power over your life and your decision-making. The reality is that your health and wellness come first. You need to be able to be fully committed to a new relationship and not fall victim to traps like using an innocent person to get over your ex-spouse. It can be difficult to know when you are ready for a new relationship, and having friends who do not understand that may not help the situation. You need to be able to talk to them about what you are feeling, so that they do not attempt to put you in a social or romantic situation that you simply are not ready for. Being open about those feelings can be a step in the right direction, but it is not always indicative of being ready. You still may have unresolved feelings or misplaced loyalty toward your ex-spouse. These types of sentiments do not always just disappear because the two of you experienced a divorce. You may require the help of a licensed mental health professional, in order to sort through these feelings in a healthy and constructive way. A licensed mental health professional can create a safe environment for you to sort through your feelings and provide clarity for you, regarding your situation. When it comes to your divorce, it can be difficult to be the most objective person, given that it happened to you. Therefore, it can be beneficial to sort through any events or feelings you may have regarding the end of your marriage. Therapy can give you the best opportunity to move forward. Moving forward should not include comparing your readiness to your ex-spouse’s readiness. Just because your ex-spouse moved on does not mean that you should or are ready to. You also should not feel bad about your lack of readiness. 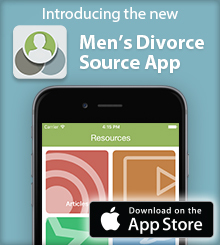 Many men take divorce significantly harder than women. There is no pace to recover from a divorce, just like there is no pace to be ready for a new relationship. You just have to know and trust that you are seeking and entering a new relationship for the right reasons. You need to be able to respect the new partner to be honest and trust that you are making the right decision for you and your future.